When the request went out to review a subscription box for The Personal Barber, I was all over it and not just because it was free swag!! Obviously, the free bit helped but I’ve been thinking about switching up my shaving routine for quite some time. I just hadn’t gotten around to doing anything about it. The Personal Barber subscription service offers a new box delivered to you every 6 or 12 weeks so you get to try a varied selection of products. Having used the same well-known brand of razor for some 20+ years, I was quite frankly bored and very uninspired by theirs and the offerings from the other big players in this market. I’ve always felt that there is an opportunity for the right company to add something different to this area of men’s grooming. While the era of metro-sexual men has taken shape over a number of years, there are some things that just haven’t changed and this is one of them. So when I was told that the box was in the post I was very excited. I even told my 2 young boys about it, who are still a very long way off from even thinking about needing to shave. When the package arrived I eagerly opened it and couldn’t wait to see what was inside. Hoping that I wouldn’t be disappointed (much). This could be slightly improved and a bit more luxury in the finer details. With that said, the items were packaged up very tidily and there was little to no waste on space. To stop the items moving about in transit there was sufficient internal shredded packaging. There were 2 leaflets inside. 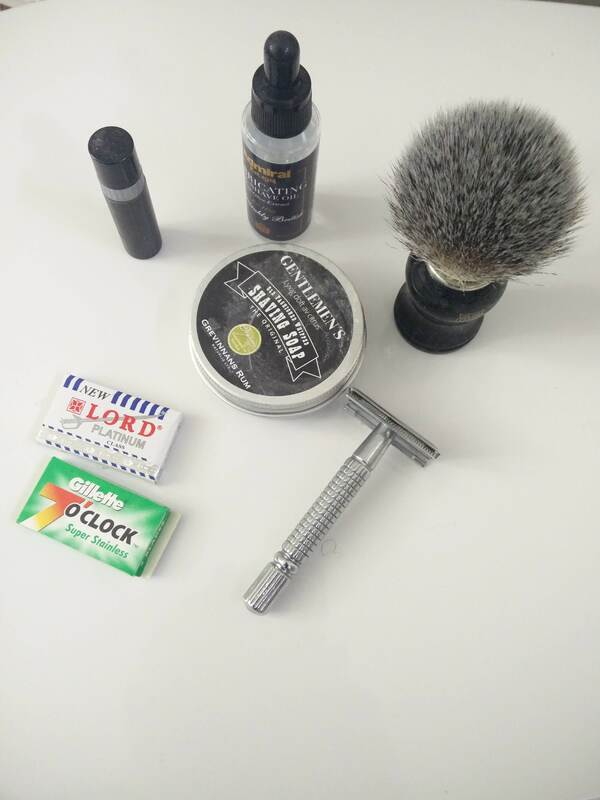 One explained the products in the kit and the other was a pre, during and post shave guide. Both were concise in their descriptions and very useful. Having a long term interest in the best and most effective ways to shave, the guide, while not so relevant for me, would be useful to the uninitiated. It explained things like taking a hot shower before shaving, so that your pores are open and the hairs being more amenable to shaving. The products were great. The razor was well made. Even in dismantling the head in order to add a blade it didn’t feel like the whole thing was going to fall apart. It also was easy to put back together and still felt solid after doing so. The brush handle or bristles didn’t feel cheap at all. After having used it a few times, they both still feel the same as when I first used them. The soap is good quality and hasn’t fallen to pieces on the first or subsequent uses. I’ve used shaving foam for a number of years alongside pre-shave oil. This soap felt much better to use than my usual foams. The styptic pencil didn’t seem any different compared to what I’ve used in the past. It did its job following a little knick towards the end of my first shave. The shave felt great and was definitely a marked improvement on my current razor. I will definitely continue using it and the other products that came in the pack. Even if I didn’t continue with this brand, I don’t think I’ll be returning back to using one of the big brand razors anymore. There’s just no need to. Especially when the shaving experience does not compare to this. Obviously, this product is targetted at a certain demographic. It isn’t something for the regular man in the street who isn’t fussed and just wants to have a shave and be done with it. But for those who are interested in this level of mens grooming then you can’t go wrong. The six-weekly subscription model is great and as a one-off gift for a special occasion though, I would definitely recommend it. Happy (and clean shaven) Alec! In this era of the hipster beard, some men are spending a lot of time and money on grooming. So I think this type of product definitely has a place in the market!